Kempsey, on the mid-north coast of New South Wales, is known as the birthplace of the Akubra hat and legendary country music singer Slim Dusty, but what if I was to tell you that Kempsey also lies at the base of some of the most spectacular 4WDing, camping and viewing points that you might ever come across? When Earth had a mighty volcanic upheaval 30 million years ago, it left a host of mountains, peaks and plateaus that, although now weathered, still point 1200m towards the sky – and most of it’s accessible for us to enjoy. 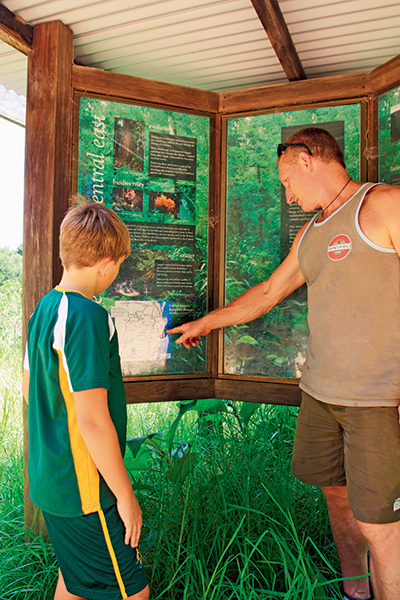 Kempsey is halfway between Sydney and Brisbane, which is perfect for an overnight stay before heading to the hills to enhance your bush time with your family and to explore a little more of the history of this area, from the timber cutters to the miners. The Macleay River is at the heart of the Kempsey Shire, and it carves its way from the mountains of the New England Plateau to the sea at South West Rocks. It rises as the Guyra River and merges with a number of tributaries including the Apsley, Chandler and Styx rivers, some 100km to the west. I hadn’t explored this region before but was invited to join a boys’ trip with a great mate and his son, and it wasn’t long before we were heading west from Kempsey along the Armidale Road. The journey is an adventure in itself. About 20km west of Kempsey, keep an eye out for the Temagog turn on your left-hand side, signposted with a locals’ info board at the corner. You will soon pick up some local chit-chat on current conditions in the area – bit like the bushman telegraph. Several kilometres down the road is a low level crossing over the mighty Macleay River. We noticed how low this new bridge is – and the reason for that is that it lets most debris flow over the top of the bridge without causing structural damage. When you’re wandering along these dirt roads, it is best to throw your lights on as you never know what may come around the next bend, whether it’s a local farmer or a 40 tonne log truck (safety first). And keep your speed to a minimum when passing local farms, as dust can wreak havoc on those days when there is no wind. These roads that twist and wind their way around this steep countryside were put in at the turn of the 20th century when hardened men sought huge red cedar trees from the Macleay valleys and plateaus. From putting in the tracks to knocking these massive trees down and trying to get them out is hard to comprehend in today’s world – they were tough men back then. There are even reports that if the men couldn’t get down into the valley to snig the logs out, they would winch them up over cliffs nearby – some of the old dozers from the 1950s and 60s had nearly two miles of steel cable on them for these jobs. Try doing that now! 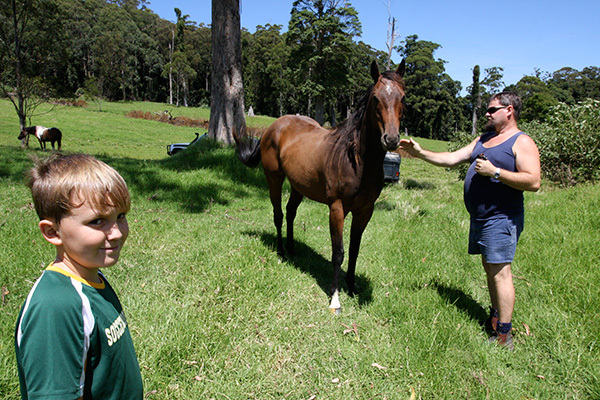 We did find an old dozer trackside and a couple of local horses wandered up to greet us. Carrai Road winds its way through pockets of thick rainforest and steep jungle forests where pines and cedar trees still stand. 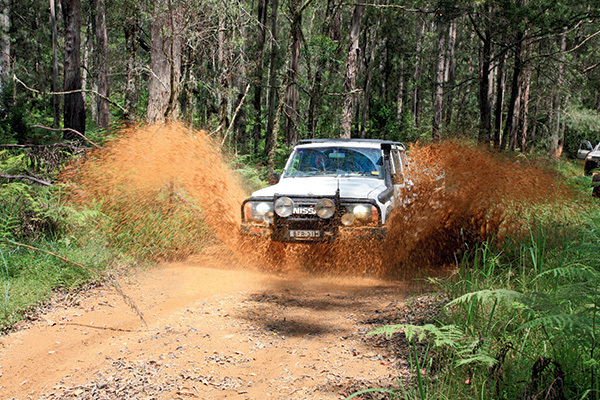 With recent rainfalls in the area we found the road was in dire need of maintenance with ruts that were wheel depth and deep muddy holes – nothing too serious – but enough to select 4WD and have a little fun. One of the bonuses of travelling along a track that rises so high so fast is the views and a notable stop is Willi Willi lookout where you get a clear outlook of the rich farmlands below, towards the coast along the Macleay River. In all fairness, this trip does sound like another drive into the hills, but around every corner there is the chance to see something new from shy Eastern spotted quolls to lyrebirds that dart across the road in front of you and, of course, the lookouts. Even the quality of the eco-systems up here are something to be seen. 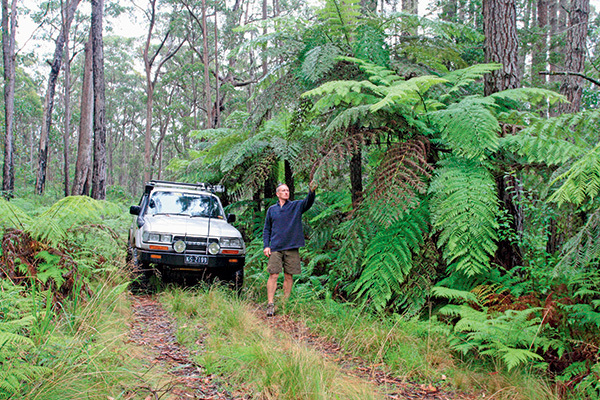 This is tall timber country yet, at the base of the trees, we spotted patches of soft maiden hair ferns thriving in the damp cool conditions higher towards the plateau. Carrai Road soon meets Coachwood Road and by veering left here you’ll soon come across the old ‘town’ of Kookaburra. There is plenty of room here for camper trailers to stop for lunch and to explore. I found myself struggling to imagine what the town folk had to endure, from snow (yes, we are 1000m above sea level) to the remoteness from the coast and the isolation. Kookaburra was established in 1946 harvesting red cedar, rose wood and coachwood from the nearby forests where there were more than 30 men employed here until 1967 when the mill closed. We spent a bit of time immersing ourselves in the boards depicting the mills workings, with maps and old pics and interesting facts. 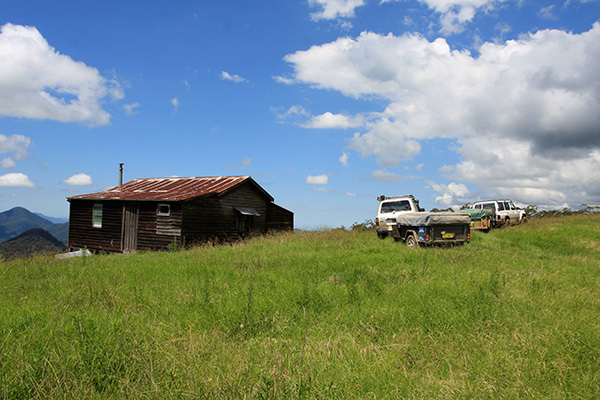 Twenty kilometres further along, an old hut which resembles something from the Victorian high country, pops out on the grassy hill. It was owned by the Macmillan family for many generations and their land housed orchards and market gardens for locals, workers and themselves. 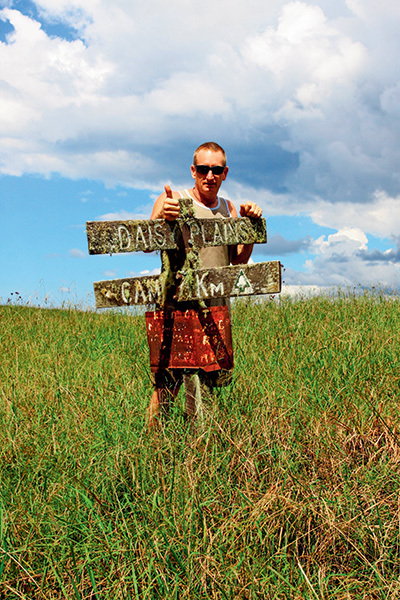 Less than 3km down the road is the original site of the Daisy plains township, all gone now, bar a stoic, moss-covered sign. More than 200 residents once called Daisy Plains home, with miners, timber cutters and families looking for their fortune. A great reminder of this area is the old Ruston Proctor steam engine that sits idle beside the track, and nearby there are old relics including boilers, building foundations and old cattle yards. We spent an hour here climbing the tractor and exploring the relics. If you are lucky enough to visit in the warmer months you’ll see masses of white, yellow and multi-coloured paper daisies across the paddocks. Another 5km down Carrari Road, you will pass what is commonly known as the Daisy Plains Huts. These huts are owned and maintained by the NSW National Parks and Wildlife Service and are surprisingly available to the public free of charge for camping and day-trip use. There are several huts in this group which include a kitchen hut, sleeping quarters hut and even a bathroom hut with a flushing toilet for the softies out there. They are based on first-in, first-served so don’t be disappointed if there are several other groups here when you arrive. We decided to camp overnight to enjoy the crisp clean air you can expect when you’re 1300m above sea level. Amid the stillness, the echo of stirring creatures travelled far during night, from hooting owls to the odd dingo the night certainly comes alive. But as for those so-called yowies, during our trip anyway, they were no more than a few ‘bumps’ in the night. The next day we headed up Carrai Road then on to Cochrane Road, for 35km towards Warrick Road on your left – this will lead you to Mary’s Lookout. Parking is at a premium at Mary’s; it can be tight if there are other cars around and just be warned: it is not advisable to tow a camper trailer here to the end of the track. You’re far better off parking at the bottom of the last climb and walking the last 500m. Once at the ‘car park’ it is a short 100m walk to the spectacular viewing area of Mary’s View. National Parks has done a great job here by installing safety barriers away from the 1000m drop below. Looking into the wilderness below towards the plateaus to the west, I found it a bit hard to comprehend how the early settlers explored these areas with as little as a bellyful of determination and a pack horse. A maze of 200,000ha of valleys, cliffs and rivers make this area home for the Thungutti people in the years gone by, where they used the rivers and ridges like roads linking the coast to the higher plateaus. To explore this area you need to be self-sufficient and well equipped. 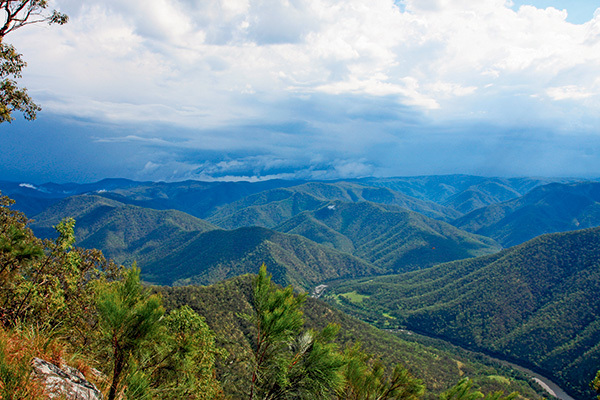 While not extremely remote, the area has no phone service once you leave Kempsey, and while there is limited reception at Mary’s View – do not rely on this alone. No fuel, water or food stops are available so be prepared. This is one trip well worth the view.